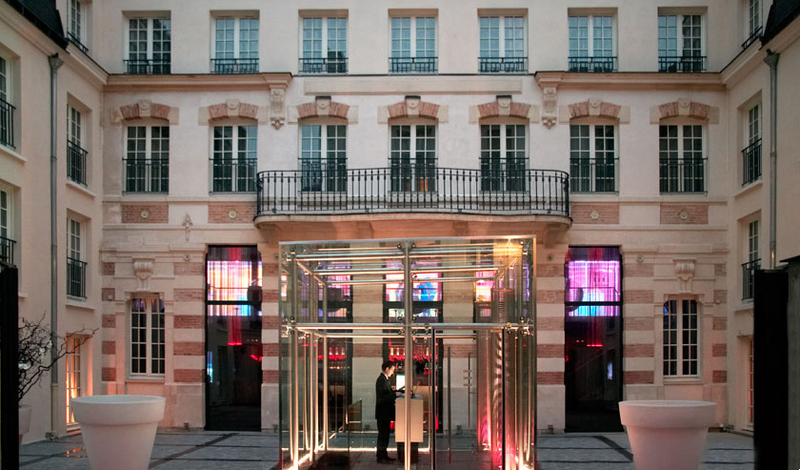 Tucked into a quiet street and sheltered from the crowds is the Kube Hotel planted near Paris’ Montmarte. 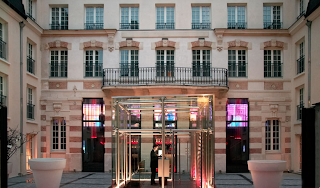 The hotel is housed in an antique Parisian building with a retro fitted modern facade which acts as the hotel’s concierge and assistance. The jolting entrance is the one of many bold concepts of the designers Raymond Morel and Christiane Derory who took the u-shaped building and gave it a mind bending revamp. Upon entering the space, you are greeted with the ultra chic Ice Kube Bar which is a destination in itself. The concept of the design is sort of 1960s sci-fi theme in its furnishings and décor, producing a feast for the eyes and senses. The hotel is plush in textures and full of Aeero Aarnio’s 1968 Bubble Chairs, shag rugs, 60′s artwork, and upholstered walls.The boutique hotel focuses it’s quality hospitality service around a 26 guestrooms and 15 suites, making sure each guest receives service above and beyond expectations. In the suites, guests can enjoy a levitating bed with color changing LED lights underneath, an in-room jacuzzi, and beautiful views of the Paris lights.